Did the question paper (Part-A) met expectation ? The answer is 'almost'. Although some questions in the areas of English comprehension and General knowledge were unexpected (and hence not covered in this blog earlier ! ), most of the questions like geometric objects, logos, design aptitude questions, Indian culture, monuments and similar type questions appeared as expected. But fortunately or unfortunately mathematical aptitude didn't appeared !. Anyway thanks to the resources - 1 and Resource - 2 section of this blog (that I covered in my earlier posts) for it helped cover most topics. What about Part-B pattern ? Part-B was split into two parts viz mandatory questions (three questions of which two carries 15 marks and one question carry 20 marks) and optional design section (three questions out of which a single question need to be attempted which carries 50 marks). Although the questions were not exact, the pattern and concept were similar, i am writing this for your initial reference, Once I get the question paper, I will update the same with solutions too ! Sketch a view showing a human in kitchen room opening a fridge door in perception. A view was given (an illustration with some three people sitting on a sofa, a couple entering the room, some chairs with a TV, A food court and some children) stating that it was a club. We need to frame a story and then write briefly in the space provided. Product Design - Design the product "A multi-use dustbin with four functionality and sections for plastic wastes, metal wastes, food and bio wastes and other liquid wastes". Storyboard - Create a comic strip with 20 frames which consists of a women on railway platform. Graphical User Interface - Design and create a page (similar to webpage) that is user-friendly and helps the users get useful information in appropriate manner. Obviously sketching part is mandatory, even though if you are not given any specific sketching work, all the remaining part-B questions like comic strip, product designs, story writing etc requires sketching knowledge. So, it's necessary that you should be good at sketching in any case, at least to the basic level. Design questions from Product Design can be expected almost every year. So, it will be on safer side to get prepared for product design type of questions even though you wish not to opt product design stream !. Clearing CEED is far better than attempting doubtful things and as per me doing Product and Industrial design questions were simpler and easier (at least to me). Surprisingly, they asked to draw comic strips in 20 frames this time, it's quite difficult (at least for me) to draw in that stipulated time. Remaining two 15 marks questions can be handled in anticipated time. Story writing requires once creativity, the same can be obtained with regular writing and framing of story. Try to create some interesting characters and frame a story, trust me; it will enhance your creative skills as well as speed your thinking power. These were the type and pattern of questions asked in 2013 CEED part-B. I Hope that the above analysis will help for your pre-preparation. 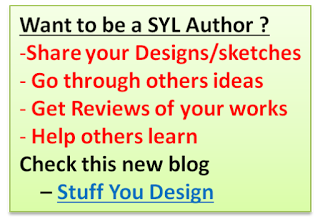 Follow Stuffyoulook Facebook page to get updated with latest posts. can u share few ideas regarding this question ' Umbrella will be kept ideal during most part of a year, state three creative multi-uses of an umbrella with three sketches (in the rectangular empty space given)' ?